Dr V is very patient enough to listen the medical problems and suggested the recommended tests for my problems. Would highlyrecommend to my friends. Dr V is very patient enough to listen the medical problems and suggested the recommended tests for my problems. Would highly recommend to my friends. This was my first visit to Dr. V's office, for a routine physical. He and the office staff were friendly andprofessional. He took notes for me to access on the web later, which is convenient. This was my first visit to Dr. V's office, for a routine physical. He and the office staff were friendly and professional. He took notes for me to access on theweb later, which is convenient. 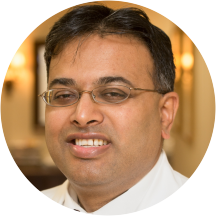 (Please sign up to checkin for your appointment at https://13128.portal.athenahealth.com/) Dr. Arun Villivalam is a concerned and caring family physician and primary care doctor serving the community of Los Gatos, CA. Dr. Villivalam attended Thomas Jefferson University, where he received his medical degree, and completed his residency in family medicine at Cook County Hospital. Dr. Villivalam is a part of Los Gatos Doc, Inc. and is board certified by the American Board of Family Medicine. He is also affiliated with El Camino Hospital Los Gatos in Los Gatos, CA and is a member of the American Academy of Family Physicians. Dr. Villivalam welcomes patients who speak English, French, Spanish, Telugu, and Kannada. His awareness of these different languages makes him accessible to patients from a variety of cultural backgrounds. He is a dedicated family man and enjoys spending time with his wife and kids. Outside of his practice, he enjoys spending time with friends, playing volleyball, and board games and watching movies. Dr. Villivalam is devoted to ensuring the longevity of his patients’ health and developing long-lasting relationships with them. He takes his time to understand symptoms and give correct diagnoses to ensure the continued health of all his patients. Thank you and see you soon! Dr. Villivalam is terrific. Highly recommend him. Got my issues examined quickly. Dr. Villivalam is a great doctor and made my Dad feel instantly comfortable. He patiently explained his diagnosis and answered all our questions. I was very pleased with my experience. Dr. V did more than I expected to assure I had all the care and testing I needed. I am very grateful. I will gladly drive 1 1/2hrs for my medical care with Dr. Villivalam. Was pleasant and felt comfortable. Very professional and caring. Asked me questions and sought solutions for issues that weren't even what I made the appointment for. I could tell he wasn't just trying to rush me out with a prescription like some doctors. Down to earth, friendly, knowledgeable, very helpful. Highly recommended! Dr. Villivalam is very patient and has excellent bedside manners. He spent a good 10 minutes understanding the history before getting to diagnosis and treatment. He is very prompt with returning your calls/messages.